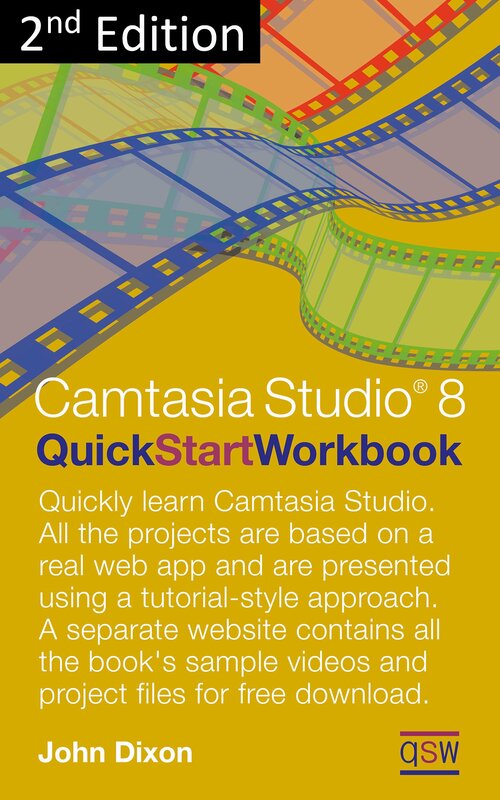 The Camtasia Studio Quick Start Workbook, which is an ebook available for download from Amazon, will help you to design and create effective and interesting videos using TechSmith Camtasia Studio 8.x. The idea of the book isn't to simply run through the menu options and commands available with Camtasia Studio, but rather to provide you with worked examples that show you how to perform tasks with the software, for example, how to create animations, how to create effective transitions between different parts of your videos, how to add voice narration, and so on. The Camtasia Studio Quick Start Workbook, which is an ebook available for download from Amazon, will help you to design and create effective and interesting videos using TechSmith Camtasia Studio 8.x. The idea of the book isn't to simply run through the menu options and commands available with Camtasia Studio, but rather to provide you with worked examples that show you how to perform tasks with the software, for example, how to create animations, how to create effective transitions between different parts of your videos, how to add voice narration, and so on. The best way to learn how to use any software application is to do just that - use it. Reading about it helps, but you need to use it in order to quickly build up your skill level and proficiency with the software. That's why this book takes a very "hands on" practical approach to learning how to use Camtasia Studio effectively; have the book open on your Kindle Fire while using the software at the same time. As well as the book itself there is this website which gives you free access to sample videos and downloadable project files that accompany each chapter in the book. You can register as an Earnings Tracker user if you want to; just use a fictional name and email address if you don't want to use your real ones. The book assumes that you are new to the enjoyable art of using Camtasia Studio to create videos; perhaps you have just been tasked by your manager at work to create a video that presents your company's latest software product, or maybe you want to start your own YouTube channel and you've been told that Camtasia Studio is a great application to enable you to do this - which it is. Or perhaps you've just downloaded a trial version of the software and you want to get up to speed quickly with it to see what its capabilities are before you buy a licence. Whatever your reason is for needing to create videos with Camtasia Studio, the book will help you. The chapters in the book lead you through a series of tutorials backed up by useful tips and other information designed to get you up and running with Camtasia Studio as quickly as possible. Supported by this website as well as being able to use a real web-based accounting application as the subject matter for the videos, working through the chapters in the book will give you real "hands on" experience with Camtasia Studio.